Christmas parties are one of the most talked about subjects at this time of year, and usually not for the right reasons! People have been taking to twitter to share their worst office party stories using #officepartyfails and it’s not pretty! It’s not surprising, then, that according to event management platform Eventbrite, non-traditional Christmas parties are on the rise. Always keen to stay ahead of the trend, the cats at Hot Tin Roof will be donning the requisite footwear and heading to the bowling alley next week, fuelled by some festive fizz, a mince pie or two, and a strong competitive streak. So if drunk colleagues, bad set menus and dodgy dancing don’t appeal (and who can blame you?) here are our suggestions for an alternative office celebration with distinctly Edinburgh theme. Book ahead to avoid the queues and head to St Andrews Square where you can hire ice skates and soak up the festive atmosphere as you do laps round the Melville Monument. Afterwards, enjoy hot chocolate with baileys or a mug of gluhwein in the fabulous on-site bar. Panto with an edge… the actors at the dungeon will be paying hilarious homage to this very British tradition, with a few surprises thrown in. Not for the faint hearted! Get together for a Christmas themed tour of the permanent exhibition of the Scottish National Gallery on 17 December. 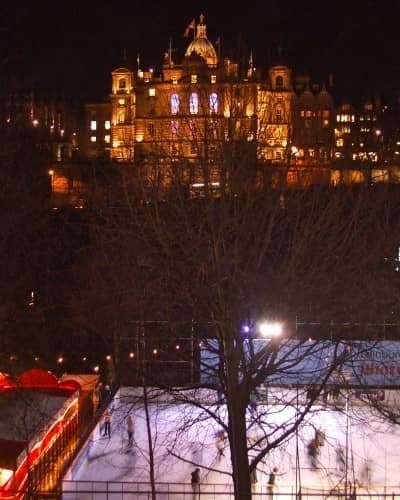 There’s no need to book and the location is perfect for a more liberal tour of Edinburgh’s Christmas markets in Princes Street Gardens after. Celebrate on the wild side with a party at the zoo. Enjoy a drinks reception and three-course lunch followed by a trip into the zoo and a viewing of Edinburgh’s world famous panda enclosure. Take part in the Real Mary King’s Close Christmas tour if you dare. Tours take place throughout December, where you’ll learn about seasonal traditions of the people of Edinburgh dating back as far as 1575. A glass of mulled wine and mince pie below the City Chambers might make it a little less frightful!